The Amazing You review: it contains an entertaining and engaging story, but it lacks focus and depth and is suited towards beginners, not people with experience. VERDICT: The Amazing You program fits you if you are beginning your personal development journey, but may not suit you if you already have experience. It may feel unusual at first because the program is an e-book that tells the story of a group of friends and their journey to become an ‘amazing me.’ The story is entertaining, and it engages us to keep reading it, but the format may not suit your taste. Each chapter is a scene containing a story, then the next section is a reflection of that story, and then you do an exercise related to the reflection. It’s a format that’s unique to this program, and you may love it, but you may not like it much either. The program claims it uses “cutting-edge techniques,” but I can’t find any in it. The format is e-book only which feels outdated for the current landscape of the personal development industry (that now delivers videos, audios, workshops, and online groups). The exercises do work, especially if it’s your first time doing a program and you have never done them before. But they don’t have any focus and feel randomly put together. If you have some experience doing these exercises, I don’t feel they can give you any new benefits other than reminders. What is The Amazing You program? The Amazing You program is an e-book that contains a story of a group of friends on their journey to become an “amazing me.” I suspect the program delivers the content in story format to make it more engaging for us to read it. We might get bored, put the book down, and forget about it if the form is textbook ‘dry’ explanations. I don’t know if a story format is better than non-fiction text, but it is different than other programs and is still useful in conveying the message. Jim. He is Nick’s younger brother but is the wise and enlightened one. He has an ordinary job and income, but he is very happy and has a wonderful relationship with his wife and daughter. Nick. He is Jim’s older brother. He is very successful in his career at a large company, but he feels his life is not satisfying and not making him happy. He wants to be like Jim and start to find meaningful experiences in life. Alex. He is Angela’s sibling. He comes from a difficult past, but he was able to overcome it and become a successful person. Now he wants to go to the next level of his success. Angela. She is Alex’s sibling. Angela had to fight social expectations to achieve her dreams. She is successful and has reached some of her dreams, and now she wants to help other people (especially Nick) do the same. You get the Amazing You program in e-book format only (PDF). A program that gives an e-book format feels outdated because many personal development programs nowadays provide content in various form, such as videos (MP4), audios (MP3), and transcripts (PDF). Some programs even have live webinars, workshops, and private forums or Facebook groups to build a community for support. However, programs that have many formats and communities often come at a higher price compared to programs that are merely e-books. The cost of the program is similar to other programs with the same theme, but other programs sometimes offer video or audio format. If you are okay with simply reading a program to get the most benefit out of it, then this feature is no problem – but if you learn by watching or listening, then you may want to choose a different program. 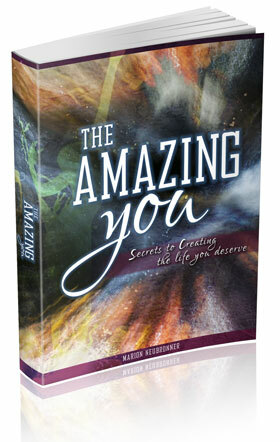 The Amazing You program is made by Marion Neubronner. Marion is a human resources expert who is a Harvard University graduate and has extensive experience training personal and corporate clients. Alvin Huang is the co-author of this program. He is a successful entrepreneur that has made several personal development brands under his company. They made this program together but it is mostly based on Marion’s experience and expertise working and coaching many of her clients. What’s different about The Amazing You compared to other programs is that there is a real author that you can contact. Some programs like this one use pen-names and model images for their profile photo. I don’t have any objections against using an “avatar,” but it’s refreshing to see that Marion Neubronner is a real person with a digital track record that you can verify yourself on the internet. How Does The Amazing You Work? There are 24 chapters in the e-book, and it is 121 pages long. Some of these exercises may be familiar to you if you have experience doing other programs. They may all be new to you if you are a beginner. In that case, The Amazing You is a good program for beginners but not so good for people who already know and have done the exercises. The exercises provide a variety of techniques that cover the most popular personal development research. It is a good collection of exercises that greatly benefit you if it is your first time doing a personal development program like The Amazing You. You will experience the benefit of building a vision of your dream life and developing awareness of your thoughts and feelings. However, it’s not very interesting if you already know the exercises. My primary concern with this program is the claim. The sales page says that it’s “the first and only system based on the latest cutting-edge psychological research.” That is a big claim that I feel doesn’t tell the truth about this program. The exercises in the program are useful, but they are not new (as you can confirm from the list above). I’ve seen similar exercises in other programs, and even in free articles or videos. I don’t think these exercises can be called “cutting-edge research” unless I am too familiar with them and they are cutting-edge for people who don’t know about them yet. The promotion also mentions techniques such as the REBT (Rational Emotive Behavioral Therapy) system or the Losada Line (which is a largely discredited concept), but I don’t find any mention of them inside the e-book (as you can see from the list). Is it a case of a false claim or is it possible that the techniques are embedded secretly into the exercises in the program? If they are embedded secretly, then I wouldn’t be aware of it – although I think it would be good if the reader is made aware of these techniques and not only the exercises. #2 Are the characters real? The characters in the story keep me reading the story until I complete it. There are some experiences that I can relate to, and the pacing of the story-telling makes me curious about what is going to happen next. The character I relate to is Nick because he desires to experience a meaningful life. The authors claim that the characters in the story (Jim, Mandy, Nick, Alex, and Angela) are real but I can’t confirm this. Maybe the names are fictional to protect the identities of real-life people. Whether the names are real or not, it doesn’t take away from the effectiveness of the program – but I feel that real-life characters (and events) would make the program more relatable and inspiring. Maybe you’re the type of person that prefers to learn from the stories of real-life people. In that case, you may find it difficult to relate to the story of the characters in the program. But if you don’t mind learning from fictional examples, then the story format of this program is enjoyable and engaging. The program provides various exercises that give you a good base to build a foundation. But it lacks focus on any single topic, such as mental health, relationships, and money issues. I have done simple exercises from the book, and have done similar exercises before I read the book (such as keeping a gratitude journal, thought log, and writing down roles). Some of the exercises are a part of my habit, while others I have stopped doing because I don’t feel their effectiveness. I would like to close this review by sharing the dream board I made while doing the exercise from The Amazing You Program. If you want to buy this program, make sure you do the exercises as that will give you the most benefit. But if you already have experience, or you want to work on a specific issue, then this program isn’t a good fit for you. 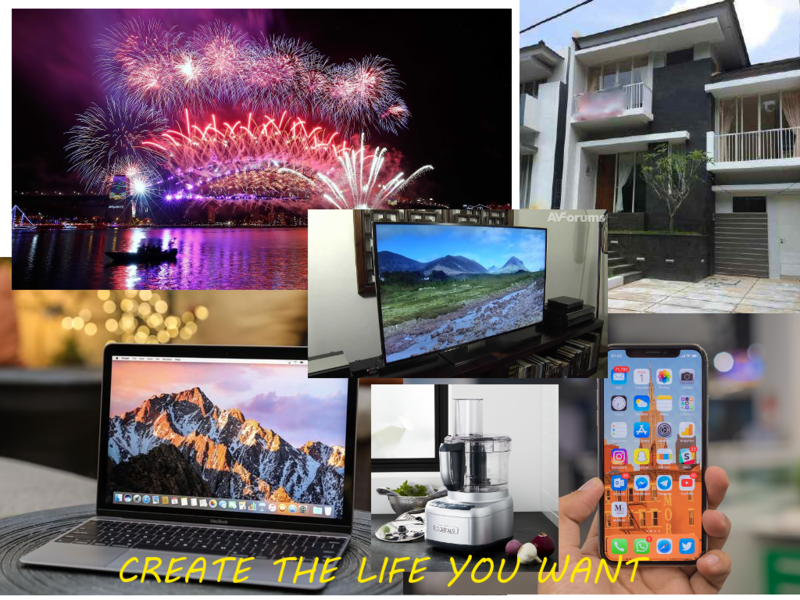 My dream board for this year: a food processor (because my wife and I love to watch cooking shows), a new smartphone and notebook for my wife (so she can work from home), a large flat-screen full high definition TV, a second home in a town with cool temperature, and a new year vacation to Sydney.